An ambulance arrives near a nightclub where a gun attack took place during a New Year's party in Istanbul, Turkey, Jan. 1, 2017. 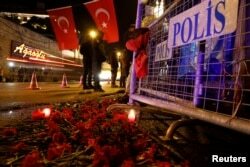 Turkish authorities have rounded up dozens of Central Asians in connection with a New Year’s attack at an Istanbul nightclub that killed 39 people. Turkish officials say they have identified an Uzbek national, Abdulkadir Masharipov, as the prime suspect. He remains at large and authorities said an extensive search for him is ongoing. While so-called Islamic State (IS) has claimed responsibility for the attack, the Turkish government believes that a larger group of militants from various Central Asian nations were involved in engineering the attack. According to Turkish media reports, more than 40 suspects from a half dozen Central Asian countries have been detained for having links with the attack. “According to recently obtained information, an IS cell in Konya that consists of Uzbeks continued to provide logistical support to Masharipov, whose code name is ‘Ebu Muhammed Horasani,’” the newspaper said. Turkey has long been a transport point for hundreds of Central Asian radicals moving into Syria and Iraq to join IS. The Soufan Group, a security intelligence firm, estimated in December 2015 that some 4,700 IS fighters in Iraq and Syria come from the former Soviet republics of Kazakhstan, Turkmenistan, Tajikistan, Uzbekistan and Kyrgyzstan. But as IS suffers continual losses in battles in both countries, some of the Central Asians have moved into Turkey, drawing the scrutiny and worry of Turkish authorities. The New Year’s attack was the third one in Turkey within a year linked to Central Asians affiliated with IS. Flowers are placed in front of a police barrier near the entrance of Reina nightclub by the Bosphorus, which was attacked by a gunman, in Istanbul, Turkey, Jan. 1, 2017. IS militants of Central Asian background were behind a suicide attack on Istanbul’s international airport that killed more than 41 people in June, authorities say. A suicide bomber from Russia’s Muslim region of Dagestan blew herself up in front of an Istanbul police station, killing at least 18 Turkish police officers in January 2015. Analysts warn that as IS struggles in Iraq and Turkey, IS leaders have instructed Central Asians jihadists infiltrating Turkey to conduct terror attacks. Last fall, Turkey supported a military offensive in northern Syria to uproot IS, and IS leaders have reportedly called for revenge attacks against Turkey. IS, in its online magazine published in Turkish, called on followers to begin an uprising against Turkish President Recep Tayyip Erdogan. Due to liberal visa policies, Central Asians are generally permitted to travel in and out of Turkey with ease. John Daly, an analyst at John Hopkins University’s Central Asia-Caucasus Institute, said that despite Turkish measures to tighten its borders with Syria and Iraq, Central Asian jihadists are able to flow back and forth with ease and have set their sights on foreign targets. “I believe Turkey is high on the list,” he said.